Originally, the Port of Brussels wanted to demonstrate that port activities and urban activities could be combined, by building a multi-purpose platform combining people and freight. Prior to the investment, a feasibility study was carried out to determine the type of freight to be transhipped. The study concluded that, without changes in the current conditions (with businesses currently located near the terminal, with the current legislation regarding truck traffic, etc. ), the last mile delivery made it not cost-effective to develop a freight terminal at this location. Therefore, the idea of a multi-purpose terminal was forgotten, and only a passenger terminal is being built. Although it led to a no-go decision, this first project of the Port shows how complex it is to implement a multimodal approach in transport. Many factors have to be taken into account, among which cost-effectiveness, as first parameter. Obviously, the distance of the last mile delivery plays an important role in this regard but it is interesting to note that public authorities can also influence private actors, by taking adequate measure to promote multimodality. If for instance a municipality decides to raise taxes on trucks entering the city or bans trucks in certain areas or at certain times of the day, not only will these measures lead to cleaner and safer environment in the city, but they will also encourage the use of alternative transport and delivery modes, like inland waterway transport. As new project, the Port of Brussels now aims at creating a network of transhipment platforms along the waterway, for city distribution activities. Two larger platforms (hubs, in red on the map) will be created in the centre and in the south, and they will be connected with smaller transhipment platforms (spots, in green on the map). This network will ensure that the last mile is kept as short as possible, so that smaller and cleaner vehicles can be used for the final delivery. This project is built around an innovative concept of freight catamaran, which can convey up to 300 tons of goods in various formats (big bags, pallets, containers, roll-tainers, tri-cycles etc). Anything that is not dry or liquid bulk can potentially be transported on these catamarans and unloaded with the onboard crane that can tranship up to 2 tons within a 12 meter reach. For the city of Brussels to be supplied by these catamarans in a cost-effective way, the Port of Brussels will develop a network of platforms, which is in line with the current plans of the Region of Brussels Capital regarding the transport of goods and mobility. TIR Centre of the Port of Brussels. This unique logistic centre, ideally located near the city centre, will soon be connected to the waterway with a transshipment platform. The Port of Brussels will carry out studies on the optimisation of hubs (circulation plan, fences, covered storage area, actual building, security issues, connecting of the central hub with an existing warehouse on the other side of the street) and the location of the small platforms (based on an analysis of existing flows and in cooperation with the public institution in charge of mobility in Brussels). Afterwards, infrastructure works will take place and the platforms (hubs and spots) will be developed. 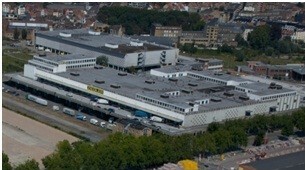 The new project will lead to a more efficient city distribution in Brussels. City distribution activities already take place within the Port of Brussels, but mainly through road traffic. The network of platforms and the use of freight-catamarans will enable the Port to widen its array of services, and in a more sustainable way. The avoided truck movements will be noticed by the public when they will see how goods can be transhipped from the waterway straight onto the street. The investment contributes to increase awareness and acceptability in several ways. Not only will the Port be active in the very centre of Brussels where it currently does not have activities, and therefore be more visible, but it will also carry out city distribution activities that, unlike other activities on the Port’s concessions, will benefit to the greater population of the city, and not only to a specific group of users or clients. The investment also has links the project implemented in Paris (i.e. the multi-purpose use of the land). Indeed, though the hubs will be dedicated platforms for the transhipment of goods, the smaller platforms between the hubs are intended as temporary transhipment spots, that will share the space with other urban functions (sidewalks, parks, parking places), on a time-sharing basis for instance. This project intends to demonstrate that port development is feasible even in contexts where space is lacking. The crane on board of the catamaran makes it possible to minimize the space and the infrastructure on shore. This new development could be duplicated in almost any inland port.